Are You Using the Right SaaS Customer Acquisition Model? Few things are as critical to the sustainable success of a SaaS startup as developing the right sales strategy. Matrix Partners’ David Skok breaks down four common SaaS customer acquisition models to help you determine the actual costs and requirements of each. Before you even think about pouring additional people and funding into your sales function, you first need to determine whether you have a customer acquisition model that’s viable. And to do that, David Skok, General Partner at Matrix Partners and author of the popular blog For Entrepreneurs, explains that it all starts with examining your customer acquisition cost (CAC). Listen to OpenView’s complete interview with David Skok here. 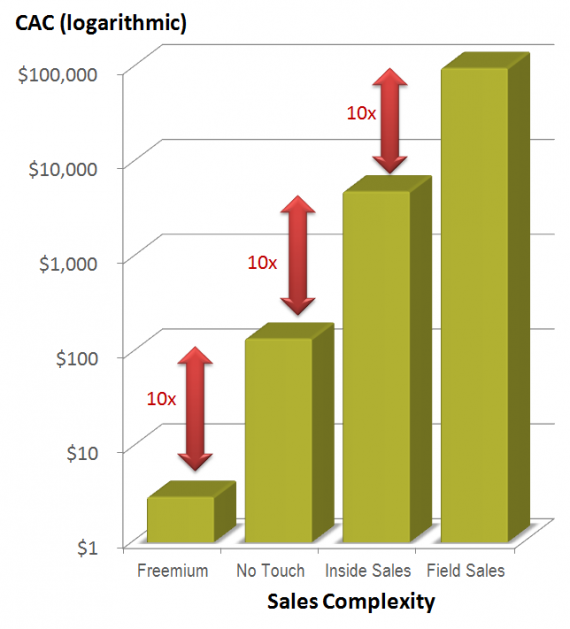 To illustrate the importance of focusing on CAC (all sales and marketing expenses divided by number of customers signed up), it’s helpful to compare several different methods of customer acquisition and plot them on a graph to see how they stack up against one another in terms of cost and the amount of necessary human touch. On the left end of the graph — with the cheapest CAC — are companies acquiring customers using a freemium model. In general, freemium only works if the company’s sales and marketing approach incorporates very little to no human touch at all. In the case of Dropbox, customers hear about the solution from a friend or on the web and eventually get to the point where they’re willing to pay for added capability/service (more storage) without ever having to engage a human in that process. Skok pegs the CAC of this model somewhere in the $20 to $70 range. At the next level are companies like Constant Contact that use a low-touch model focused on a free trial. “These companies don’t do much selling,” Skok explains, “but they are working to ensure that the trial goes well and that the customer is successful.” He estimates a typical CAC for this low-touch model to be around $400. As you get closer to the right-hand side of the graph, CACs begin to spike dramatically. 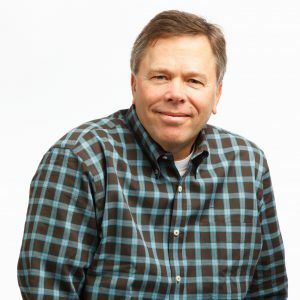 Skok uses HubSpot as his next example of a company that relies on inside sales — and, therefore, commission and salaries — pushing the CAC into the $5,000 range. At the very end of the spectrum are companies like Netezza, which focuses on million-dollar enterprise deals for data warehousing. These require an expensive field sales force, potentially with a sales engineer for on-site proof of concepts and additional professional services, as well. For these companies, the CAC is likely around $100,000 or more. 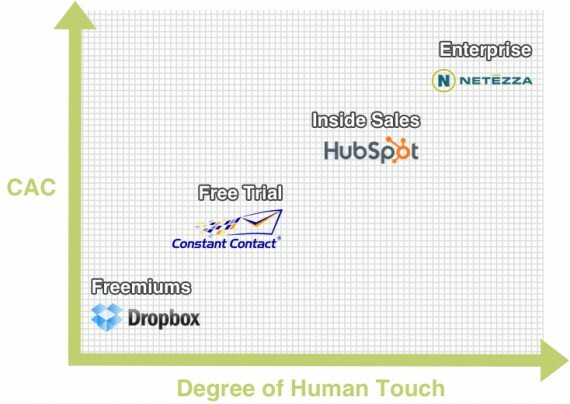 According to Skok, the most important takeaway to glean from this graph is remembering that for every additional level of human touch you add to your customer acquisition technique, you can expect roughly a tenfold increase in CAC. For SaaS companies targeting customers at lower price points, that means it’s incredibly important to design a go-to-market model in which you remove and find ways to replace human touch. Of course, if you’re targeting customers that yield high lifetime value, correspondingly high CAC isn’t as much of an issue. Achieving and maintaining the right ratio is what’s key. As a general rule of thumb, Skok suggests that lifetime value should be at least three times greater than the cost spent to acquire new customers. If it isn’t, you need to go back to the drawing board to determine ways to raise your prices and/or reduce your costs. Determine whether you have a viable customer acquisition strategy and whether your sales model is set for scalability and growth. Read more. Which SaaS customer acquisition model does your company use and why?